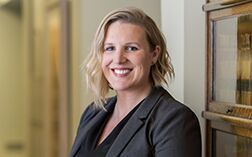 Nicole Brodie Jackson focuses her practice in the areas of transportation law, employment law, and insurance defense litigation, including motor vehicle liability. Ms. Jackson also has substantial experience in high profile general liability defense matters, with an emphasis on complex multi-party litigation. Her clients have included financial institutions, communities of faith, water districts, and healthcare providers involving various claims for collection, bankruptcy, auto deficiency, insurance subrogation, personal injury, and sexual abuse. Ms. Jackson’s litigation experience includes intensive motion practice and trial work at all levels of the state court system, as well as experience in appellate, federal, and bankruptcy practice. Rosas v. Corporation of the Catholic Archbishop of Seattle, 598 F.3d 668 (9th Cir. 2010) - A former Catholic seminarian from Mexico who was engaged in a ministerial placement alleged that he was owed overtime pay for work he performed. The U.S. District Court dismissed his claim, concluding it was barred by the ministerial exception. (Prevailed on judgment on the pleadings.) The U.S. Court of Appeals for the Ninth Circuit affirmed. Chase Manhattan v. Orr - Division I of the Washington Court of Appeals upheld summary judgment of the plaintiff's claims.